We turn our attention to a 3DS eShop game. 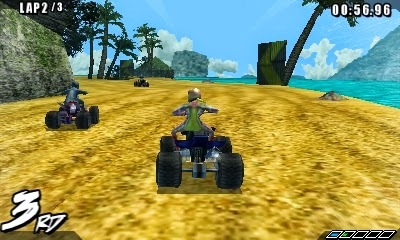 ATV Wild Ride was launched near the end of the Nintendo DS system's lifespan. 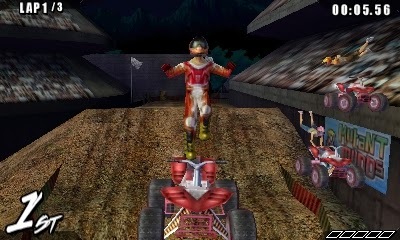 Now, developer Renegade Kid is giving the game a second chance in the spotlight with ATV Wild Ride 3D. How well does it play? Let's find out with our review. Originally a Nintendo DS game that was released late in the system's life, ATV Wild Ride has received a bit of an upgrade with a release on the Nintendo 3DS eShop. From the creator of Mutant Mudds, ATV Wild Ride 3D speeds onto the 3DS with tight racing controls, entertaining online, and a low entry fee. Should you hop aboard and ride? ATV Wild Ride 3D's solo content consists of four unique modes: World Tour, Quick Race, Freestyle, and Time Trial. World Tour has six individual tournaments to complete, each made up of a quartet of events. These aren't just simple races, though there are two of these in each tournament. The other two events of each tournament are composed of elimination races and trick challenge events. The former eliminates the racer in last place at the conclusion of each lap, while the latter forgoes the idea of racing completely, having you and your competitors performing tricks in order to gain the most points by the time the clock runs out. Performing duplicate tricks lowers how much they are worth. These modes add some much welcomed variety into ATV Wild Ride 3D's gameplay, and are the means to unlock new riders and new vehicles. Maneuvering your ATV feels incredibly nice, and this is enhanced by the very simple to learn controls. You accelerate with A, brake with B, tap the X button to boost, and then perform tricks with the shoulder buttons. While holding either or both of the shoulder buttons, you use the Circle Pad or directional buttons to pull off various tricks. L button tricks are easier to pull off than the R buttons tricks, which, in turn, are not as risky to attempt as doing tricks with both shoulder buttons pressed down. For each successful trick you land, you gain boost energy. The riskier the trick you land, the more boost energy you gain. However, all is not well with ATV Wild Ride 3D's racing. Tricks themselves are probably the most challenging feat to successfully accomplish in Wild Ride. In order to get the maximum amount of height off of a jump, you need to hold the Circle Pad back and move it forward at the summit of the hill. When you're in midair, you move the Circle Pad in a direction, as stated, to pull off a trick. However, unless you have the precision in your thumb of a robot, on many occasions you will deviate off course, making running into a wall instead of the open track more common of an occurrence than it should be. There are but a handful of tracks in ATV Wild Ride 3D, based on six locations around the globe, but each track has multiple versions (reversed versions, extended versions, and so forth). They offer a mild sense of personality, truth be told. Nonetheless, the track design is definitely hit and miss. Generally there are ample amounts of places to perform awesome, death-defying tricks off of. At the same time, some hills that are intended to provide you with a spot to trick off of simply lead you careening into the abyss-- and this is even with approaching them extremely cautiously and slowly. This isn't just true for human players, either. No, the AI also has a strong habit of doing the same thing, they sometimes get stuck on walls, and they seldom showcase actual intelligence when racing. The track design consists more of memorization than it being based off of reaction time. When you've got a giant hill in front of you with no way to see what's on the other side (perhaps it's safe, perhaps it's a bottomless pit), there's a serious design problem here. What's also a serious design problem is the amount of clipping in the game. Objects like boulders and signs that you would think you'd smack into allow you to speed right through them. There's also very little consistency here. Some objects stop you, many others do not. It just comes off as sloppy. For those wanting some competition from something other than programmed AI, there's online play to enjoy with racers across the globe. There's some beefs to be had here, however, such as races in progress not appearing in the lobby, and the host of races needing to back out to the lobby in order to allow new players into a game. Regardless of these inconveniences, actual races for me tended to be lag-free and the problem some racers have with kicking players out mid-race wasn't an issue. 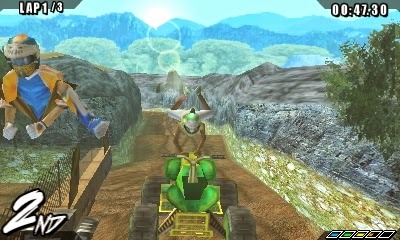 Being a late generation Nintendo DS game originally, ATV Wild Ride 3D supports the types of graphics one would expect-- muddy visuals, simplistic polygonal characters and environments, and so on. The music that plays during races is some kind of alternative rock that gets quite annoying when the three or four songs there are repeat themselves ad infinitum. I simply turned the sound off and listened to some Tom Petty instead. 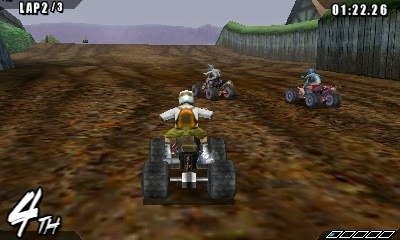 ATV Wild Ride 3D seems like a smart and inexpensive purchase for those yearning for a nice, compact handheld racer. Nevertheless, some technical and design issues make it so the game doesn't get a wholehearted recommendation from me. Like an off-road track after a downpour, there's a lot that is sloppy here. At the same time, there's a lot that is done well, too. Overall, ATV Wild Ride 3D is a ride worth taking.